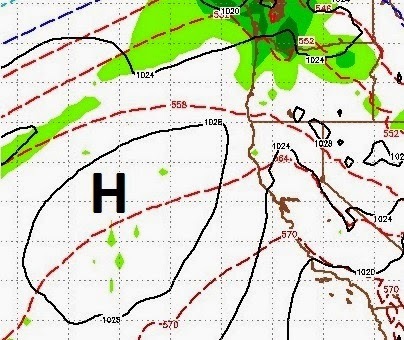 High Pressure About to Take Over; Long Range Forecast, DRY! I apologize for a busy travel schedule. However, not much has changed since my last post, unfortunately! We have two shots for much needed additional snowfall. One of those is knocking on the door right now. This system is weak but holding together. We can expect perhaps 3-9 inches of snow at Mt. Rose and slightly more near the western crest of the Sierra. There is a very ample moisture tap but not enough strong storms that can tap it and have enough lift to get over the mountains. 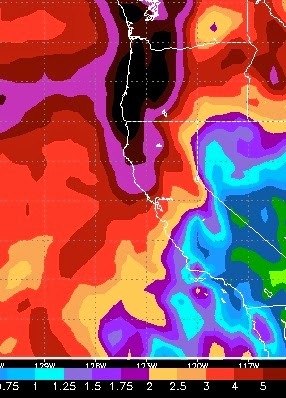 The "storm of the season", as dubbed by the NWS, brought tremendous precip to California but did not have the lift to get over the Sierra, then took an abrupt turn south. That was very disappointing as that was the only storm with the potential to add significant snowfall. Very painful, all that moisture just 60 miles away! Our next chance of snow comes on Christmas Eve. However, the models are backing off a significant precip event for this. Our problem now is a large ridge of high pressure which is acting as a blocking force, driving the storms well to our north. That ridge will move in starting tomorrow. For the Christmas Eve storm, the question is whether or not the system will have enough strength to push the ridge further south. My gut tells me no and I hope I eat crow on this one, but remember 10 days ago I warned of imminent dry conditions coming in the last 10 days of December and at least early January. My long range models are sticking to that forecast. High pressure is firmly in control. Temperatures will be well above normal and could push 60 degrees in the valley. As this storm approaches it will weaken. 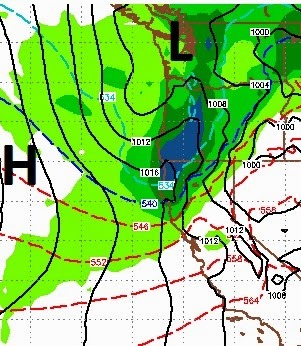 This will be a very good snow event for the state of Oregon; not so much for us. Once this storm has pushed through, the ridge of high pressure will plant itself right over our area. I am seeing pretty dry conditions from the 26th of December through the first week of January, at least. This does not look any better than the near term forecast. Once the Christmas storm moves through our area, we could be looking at a significant dry period. Here is the 30 day precip total, most of this is forecast to fall in the next week or so. Before you get too depressed remember this is called fantasy because it is so far out. A simple change in conditions that would cause this forecast, may blow it up! Let's hope so. When Will The Storms Return? Is Santa Going to Bring Snow?